Church of the Big Sky: Well, that's grotesque. Mr. Frank Ames of Saranac, New York is in the Guinness Book of World Records for having the longest eyebrow hair in the world. It's more than three inches long. 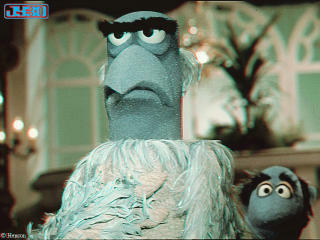 Sam the American Eagle - acceptable enormous eyebrows. The article doesn't note whether or not Frankie's married. I have a funny feeling he's not. Most women would probably whack those suckers off in the middle of the night. When your eyebrow hair is 3+ inches, doesn't it hang in your eyes? Is there some sort of "eyebrow wax" to hold them back? (uck.) I'm sure that Wahl makes some sort of trimmer appropriate for this type of affliction. 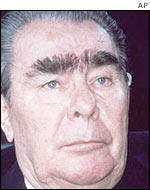 Leonid Brezhnev - massively unacceptable enormous eyebrows. If not, I invite Mr. Ames to lovely Rockville, Maryland, where I know some very nice ladies at the Elaj Aveda Day Spa who would be happy to wax those suckers into decent submission. Really. Dude, I'm broke, but I will still pay for it. Suddenly my browage looks pretty tame, no? Grudgingly, I will admit that. I still want the honor of plucking the freaky hairs out, though.